I am excited to be starting a five week series of sermons on the Book of Revelation. The series is titled, “Jesus’ Revelation.” Whether you love studying the book of Revelation or you find it intimidating and stay away from it, I think you will find this series relevant, helpful, and faith affirming. While Revelation contains beasts, false prophets, and the anti-Christ, the main focus is not on them. The main focus of Revelation is Jesus. It is a revelation of Jesus and from Jesus as we will see in our first sermon this coming Sabbath. I hope you are familiar with our fantastic children’s choir at Madison Campus, Kids in Tune. If you aren’t, Kids in Tune has been an important part of the ministries at Madison Campus since 2007. The choir is for children ages 4 to 12 and is led by Gissela Kroll. They have produced an album with music videos and have toured extensively. There are no auditions, any child who wants to participate is welcome to do so. Join Kids in Tune for a year of song and service, beginning with registration and first practice on August 25 at 2:30 pm. Performances are once a month and will include special places like Centennial Park, Opry Mills, the Nashville Sounds, and Dollywood! Naomi’s fellowship will meet August 26 at 2 pm in the downstairs fellowship hall. Madison Campus Elementary needs our help. Join me in giving generously to the “Worthy Student Fund” so that we can honestly say that we do not turn away for financial reasons any student who desires a Seventh-day Adventist education. You may place donations in your tithe envelope and mark them for the Worthy Student Fund, or give online at www.madisoncampus.org, or give your contribution directly to MCE. Sabbath, September 8, we will begin with Dinner at 6:30 pm, Worship at 7 pm, Contest Awards 7:15 pm and Christian Illusionist at 7:30 pm. There will be 12 tables (one for each month) with 12 cakes that will be judged. If you would like to participate in the contest, call or text Jennifer Taylor at (615) 498-3973 for availability to enter contest. Come celebrate your birthday! If you have a desire to help others, a position is available in the Help Center Food Pantry. Help is needed on Wednesday and/or Thursday from 9:00 am to 2:00 pm. Please contact Karen Baker, ACSC Volunteer Coordinator, at (615) 516-8631 for more information. If you’re a young adult, please remember to follow us on FB at Compass (Madison Young Adults). Portland, TN-Highland Academy will host the annual High Five 5K Fun Run on Sunday, September 30, 2018 starting at the Highland campus. There will be a Kids Fun Run at 1:30 pm ($10), the 5K at 2:00 pm ($35), and the one mile run at 2:05 pm ($15). However, if you register early for the 5K there are discounts (see registration info on website). T-shirts are guaranteed if registered by September 14. For more information, visit www.highland-academy.com. 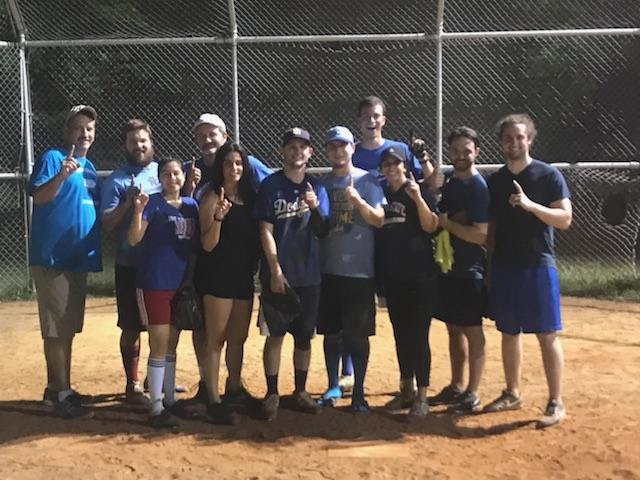 Congratulations to the Dodgers who won our church softball league championship: (L to R) Dan Johnson, Austin Johnson, Stephanie Goldstein, Tod Barrow, Betina Didomenico, Nathan Dearman, Chris Fairchild, Jimmy Closser, Taylor Abeyta, Matt Dearman, & Reed Apple. Watch the announcements in this newsletter and the church bulletin if you are interested in playing in any of our church sports leagues. Coming up next is flag football and there is a possibility of a Fall softball league. Stay tuned. Then I saw a new heaven and a new earth, for the old heaven and the old earth had disappeared. And the sea was also gone. And I saw the holy city, the new Jerusalem, coming down from God out of heaven like a bride beautifully dressed for her husband. I saw no temple in the city, for the Lord God Almighty and the Lamb are its temple. And the city has no need of sun or moon, for the glory of God illuminates the city, and the Lamb is its light. The nations will walk in its light, and the kings of the world will enter the city in all their glory. Its gates will never be closed at the end of day because there is no night there. And all the nations will bring their glory and honor into the city. Nothing evil will be allowed to enter, nor anyone who practices shameful idolatry and dishonesty-but only those whose names are written in the Lamb’s Book of Life. When you write a letter you leave the most important message for the end. Revelation is a letter to God’s churches. In the passage above we see that Jesus left the most important message for the end. While sin has wrecked havoc on the universe it will not always be so. In the end, God wins. His people are triumphant. Peace and order are restored. God keeps His promise to never leave or forsake His children. This is the gospel, it is the good news, it the truth. Revelation is a message to you and I that while the earth will go through terrible times Jesus never leaves us. He will always be by our side and will see us through to the new heaven and new earth. Even then He will remain with us and we will enjoy eternity with Him. That’s good news!